The Independent Corrupt Practices and Other Related Offences Commission (ICPC), has recorded another successful prosecution in its relentless pursuit to rid Nigeria of visa racketeers. The Commission secured a conviction for one Adedeji Ayobami at a Lagos State High Court, sitting in Ikeja, for attempting to procure a United States of America (USA) visa with forged documents. 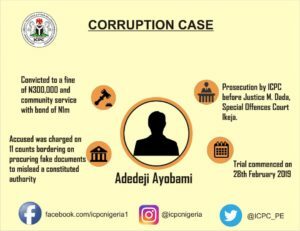 Ayobami was charged before Justice Mojisola Dada of the Special Offences Court by ICPC on an 11-count charge bordering on procuring fake documents to mislead a constituted authority. The court was told that the offence committed by the accused was contrary to Section 13 and punishable under Section 68 of the Corrupt Practices and Other Related Offences Act, 2000. The convict and one Mr. Akin who is now at large both conspired to forge document to wit: a Nigeria International passport with the convict’s name containing a UK visa knowing the documents to be false with the intent that the United States of America Consulate in Nigeria will act on it as genuine to procure a US visa for him. The Commission acting on a report that Ayobami had presented false and misleading documents, arrested him at the premises of the US Consulate in Victoria Island, Lagos. In his statement to investigators, he admitted being in possession of and presenting the false document to the Consulate. He further admitted to having been assisted by Akin, a visa agent, to procure the fake document. Counsel to the defendant, Mr. Taofik Jimoh, approached the Commission through a letter proposing a plea-bargain after he had pleaded guilty on all the counts. The trial judge convicted and sentenced him to a fine of N300, 000 and community service of clearing bricks in the court premises under the supervision of the Court Registrar, while failure to comply would lead to imprisonment for three years. The convict must also submit a bond of N1 million to be of good character to the court, while a breach of it would amount to a forfeiture.